Practice Energy Engineering questions and answers for interviews, campus placements, online tests, aptitude tests, quizzes and competitive exams. This set of Energy Engineering Multiple Choice Questions & Answers (MCQs) focuses on “Atomic Structure”. 1. Why has nuclear energy become an inevitable option for the development of the country? Explanation: With the acute shortage of other sources of energy viz. fossil based fuels and hydel sources the use of nuclear energy has become an inevitable option for the both developed and developing country. 2. How much amount of nuclear energy burnt is equivalent to the energy produced by 3000 tonnes of coal? Explanation: The amount of heat generated by burning one kg of nuclear fuel is equivalent to the energy generated by burning 3000 tonnes of coal or 1600 tonnes of oil. The production of Nuclear energy is carried out by two methods which are nuclear fission and nuclear fusion. 3. What is the most attractive part of nuclear energy? Explanation: Most attractive part of nuclear energy is that it has no combustion products and under safe working conditions contributes no pollutant to air. Site selection is completely independent of geographical area. 4. Nucleus consists of two sub-particles known as? Explanation: Atom consists of a relatively heavy, positively charged nucleus and a number of much lighter negatively charged electrons. Electrons exist in various orbits around the nucleus. The nucleus consists of two sub-particles known as nucleons. 5. The atom as a whole is electrically charged. Explanation: The atom as a whole is not electrically charged it is actually electrically neutral in its state. The electric charge on the proton is equal in magnitude but opposite in sign to that of electron, the number of protons is equal to the number of electrons in the orbit. 6. On which law is the nuclear energy explained? 7. Identify the element by its Atomic structure. Most of the mass of the atom is in nucleus. The red dot is a proton it has positive charge of 1 unit, and black one is an electron, which has a negative charge of -1. There is only one orbital for hydrogen. 8. Identify the element by its atomic structure? Electron mass, me = 0.0005486 amu. Explanation: Number of protons in the nucleus is called atomic number Z. it is unique for each chemical element, and represents both the number of positive charges on the central massive nucleus of the atom and the number of electrons in orbits around the nucleus. Explanation: The total number of nucleons in the nucleus is called the mass number A. Nuclear symbols are written as zXA Where X is chemical symbol. The masses of atoms are compared on a scale in which an isotope of 6C12 has a mass of exactly 12. 11. To disrupt a nucleus and separate in into its component nucleons, energy must be supplied from outside and this energy is called? Explanation: To disrupt a nucleus and separate in into its component nucleons, energy must be supplied from outside and this energy is called Binding energy. The nuclear force acts only when the nucleons are very close to each other and binds them into compact stable structure. 12. The net neutrons produced per initial neutron accounting for all possible losses is called? Explanation: The net neutrons produced per initial neutron accounting for all possible losses is called multiplication factor (K). If: K < 1 = system is subcritical. K = 1 = System is critical. K > 1 = system is super critical. 13. What is the time during which one half of a number of radioactive species decays or one half of their activity ceases? Explanation: Half life is the time during which one half of a number of radioactive species decays or one half of their activity ceases. It is also used to characterize any type of exponential and Non-exponential decay. 14. Electrons that orbit outermost shell of an atom are called? Explanation: Electrons that orbit outermost shell of an atom are called Valence electrons. The outermost shell is called valence shell. The presence of valence electron can determine the element’s chemical properties. Explanation: A covalent bond is also called as molecular bond, which involves sharing of electron pairs between atoms. These electron pairs are known as shared pairs or bonding pairs, when these share an electron than it is called as covalent bonding. 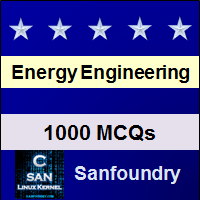 Sanfoundry Global Education & Learning Series – Energy Engineering. To practice all areas of Energy Engineering, here is complete set of 1000+ Multiple Choice Questions and Answers.